Posted: 2011-12-01 | Author: BJ Hill | Filed under: Uncategorized | Comments Off on Done! Me standing in front of the White House after my fifteen meeting with President Barack Obama in the Oval Office. Notice the books are missing. They are in the president’s hands. As I write this in late February, I am working on a complete account of the once-in-a-lifetime meeting. So far it’s about ten pages long. Single-spaced. I’ll post when it’s ready, hopefully soon. Also, I am waiting for the photos. I had my cell phone and Jen’s camera with me, but I was told explicitly to leave them in my pocket when I got into the White House. There was an official WH photographer snapping candids of the president and me. I’m not sure when his office will develop them and send them out. I’ve heard everything is done with print film so they must be developed the old-fashioned way. And I’ve also heard (from Jen’s aunt and cousin, who met President Obama a few years ago as part of a larger event) that it takes eight months to get pictures back. So hopefully I’ll have them by the summer, and I’ll be sure to post them here as soon as I do. As always, thanks for reading and I’m very grateful for everyone who helped me on these walks in 2006, 2008, and 2011. Feel free to contact me at highwaytohill@yahoo.com, especially for information on how to walk across America . Up next : writing the book . Posted: 2011-12-01 | Author: BJ Hill | Filed under: Uncategorized | Comments Off on Just feet away…. Thursday morning I woke up, dressed, and Jen and I walked the final mile to the southwest gate of the White House. We arrived around 11:15 for my 11:40 appointment. Jen snapped this final picture as I showed my ID and passed through the first security checkpoint. The night before I surrendered the books to President Obama, Jen and I found a small family-run print shop open late to photocopy all the messages which I had just collected in previous four weeks. The first three books, from 2008, had already been scanned by Curry Printing in Worcester. (Note that some of these photos from DC aren’t exactly in chronological order). A better picture of the Australian Embassy. Yes, the man on the surfboard is wearing a Santa hat. The Arc of the Moral Universe…. Posted: 2011-11-30 | Author: BJ Hill | Filed under: Uncategorized | Comments Off on The Arc of the Moral Universe…. We didn’t see (or look for) the controversial self-aggrandizing quote, “I was a drum major for justice, peace and rightousness,” which will be soon be effaced and replaced. At the newly-opened Martin Luther King, Jr Memorial. On December 1st, 2011, I met with President Barack Obama in the Oval Office. During this 15-minute sit-down meeting, I personally handed him your messages. It was an honor to represent my fellow Americans, and I gotta say, 15 minutes alone with the Leader of the Free World was pretty intense! I've posted all of the original messages at www.WalkAmerica2008.com . There's lots to see there... enjoy! What is Walk To The White House? 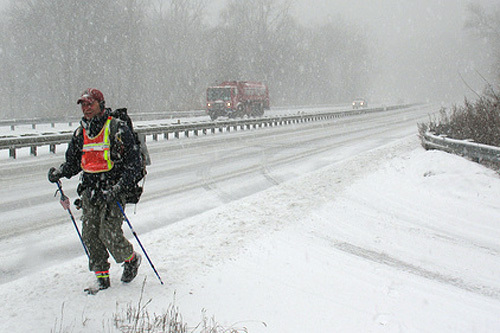 In 2008 I walked across America, 4250 miles from San Francisco back to Boston. I carried a blank leather-bound journal and asked people he met write their personal message for the soon-to-be-elected President of the United States. By the time I finished in Boston ten-and-half-months later, I had collected thousands of handwritten missives, from welfare recipients to business owners to teachers and farmers, on topics ranging from the economy, the environment, UFO research, to the War on Terrorism, even notes of congratulations and advice for marital bliss. Now, thanks to Sen. John Kerry’s office, I have an appointment to meet with President Barack Obama in the Oval Office. True to the spirit of the original walk, once again I am walking the 450 miles from Boston to Washington D.C. I set out from the Mass. State House on October 30th and I must cover an average of 16 miles per day to make my meeting on December 1st. Again, I'll be collecting messages for the president along the way. Check back here for updates, photos and notes, and thanks for reading. The 2008 route covered 4250 miles through the four major regions of the United States.